It was November of 2015. I was staying for one month in Peru, visiting that incredible country and also “resetting” my life. Besides photographing a lot there, I also have interesting travels stories to tell you :). 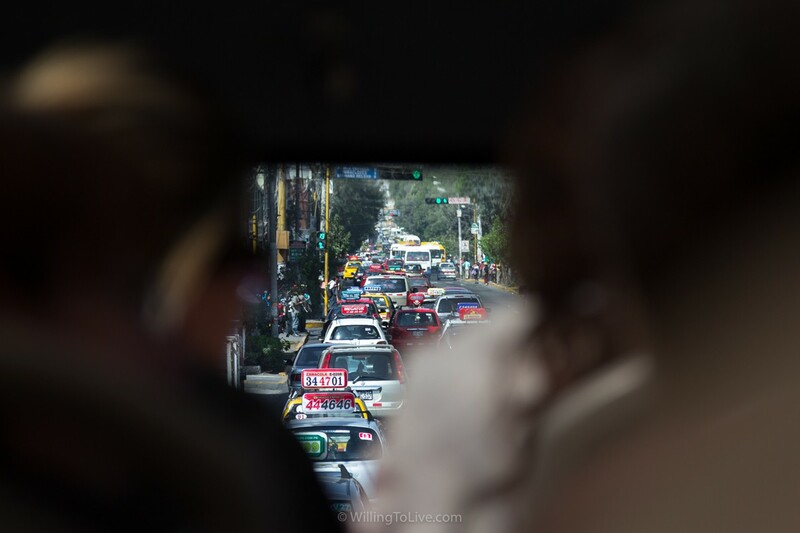 This story is about the crazy traffic in Peru. That day, I was staying in Ica and just wanted to go to a neighbor city called Nazca to see Nazca Lines. But Peru traffic has its own surprises and I had an adventure before the real adventure in Nazca while in a taxi going to the bus terminal. C’mon, Filipe. What is the problem of getting a taxi? A small crash followed by a pursuit and also with police involved is enough for you? Hahahaha :P Like a movie, my friend! I’ve bought the Nazca Lines tour with the help of the hotel I was staying in Ica. The hotel also helped me to schedule a “trustworthy” taxi to get me from the hotel till the bus terminal so that I could go to Nazca. The hotel was really good except that recommendation, hahaha. The traffic was intense. It was a mess like in Arequipa, but I would say It was worst. The driver crossed to the central part of the avenue, but there were also many other cars and together with them some “tuctucs”/mototaxis, those 3 wheels “cars” that you can see in the picture above. Guess what happened? The taxi driver was turning to get to the other side of the avenue but a mototaxi was doing the same and… crash… yes. And yes, the taxi driver could have avoided it, but whatever… he scratched the old mototaxi. The mototaxi driver got very angry immediately. He jumped out of the 3-wheel vehicle and went in our direction to “talk” to the taxi driver. I said it would get interesting. Well, for you that is reading. I was late for my bus and I didn’t want to be involved in local news hahaha. But, can you guess what happened? Not that difficult to guess that suddenly the mototaxi appeared from our right, in high speed, passed us and thrown his tuctuc in front of our car. Now, you won’t believe. But it really happened. The taxi driver hit the tuctuc again! He didn’t stop as fast as required and crashed at the back of the tuctuc. I was asking myself, did he hit the same car twice? He is kidding me!! Is he trying to make us laugh? Hahahahaha. No way! What a dumb driver. The tuctuc driver was already mad, after that second crash he got insane. I was scared. But my taxi driver was very calm, smiling, like nothing was happening, in a “don’t worry, be happy” state. He seemed to be acting like he was superior and nothing could get him, it was strange. Again, the mototaxi driver came to the taxi driver window and this time he opened the window and they started to “talk”. Give me your license and your ID!! The taxi driver calmly opened the glove compartment and gave him just his business card. Hahaha, funny man. Where is your driver’s license?!?!?!?! Whaaaaattttt??? I’m in a taxi that the driver doesn’t even have a license to drive!?!? WTF! OMG!! I didn’t say that, just thought about it. The situation had enough problems already. You can imagine how angry the tuctuc driver was. But then, another movie like coincidence happened. A police car was just passing by and when the mototaxi saw it, he almost jumped in front of the police car to stop it and ask for help. Then I thought… ok, no more Nazca Lines today, we are really in trouble right now :(. But, at least with the police around, none of the drivers would try something stupid and nothing really bad would happen. The police came to talk. To my surprise, the taxi driver said he was taking me to the bus station that was very near there and that I was late to get the bus. Ok. You can take him to the bus terminal, but I’m going with you. He entered the car. We got to my destination, the taxi driver calmly explained to me where I needed to go to get the bus inside the terminal and also said that everything was ok (he probably have noticed my scared face and really not believing on what was happening face). I answered him back with “Cuidate”, an expression that I’ve heard from Peruvians many times in this travel (something like beware, take care of yourself). And that was it. I have no idea what happened after that. I just know that I got the bus on time and saw Nazca Lines some hours later. Awesome that you like to travel and to photograph and also want more content about it!